Hello and welcome to the My Favorite Things December New Product Tour! All of the stamps and Die-namics that you have been teased with over the past 7 days are now available for purchase in the MFT Boutique! Before you head off to purchase your items, you might want to hop through the new product tour to see if you missed an item or two! For a complete list of designer's links, please start at Kim's blog! I am showcasing the new Triple Scoop, Clearly Sentimental about Pearls of Wisdom. Remember, you can get this set for free with a $60 purchase (just be sure to remember to add it to your cart). The set will also be available for purchase after next month's release. 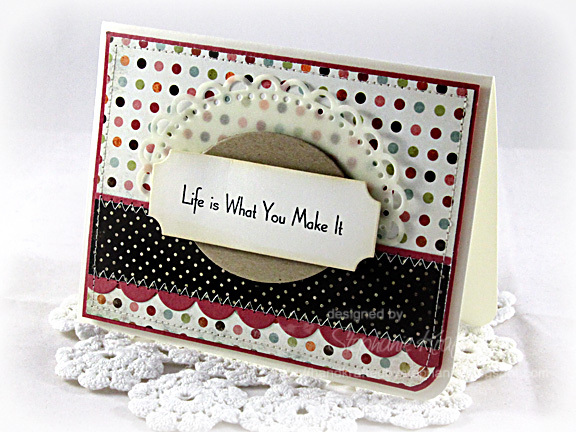 After making my tag book (click here to see my tag post), I decided to make a set of cards with a few of the pearls of wisdom. 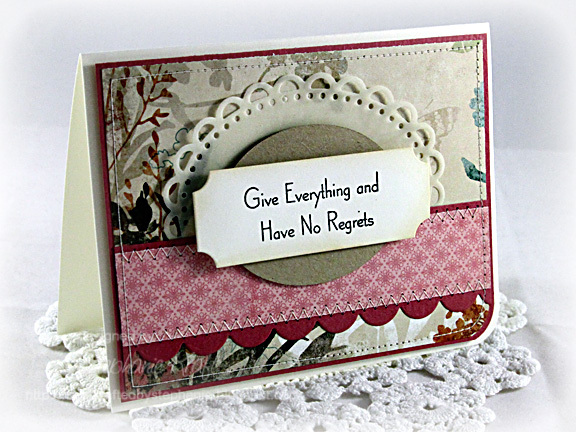 I made each card with the same layout and mixed and matched patterned papers from the My Mind's Eye Vanity Fair collection. 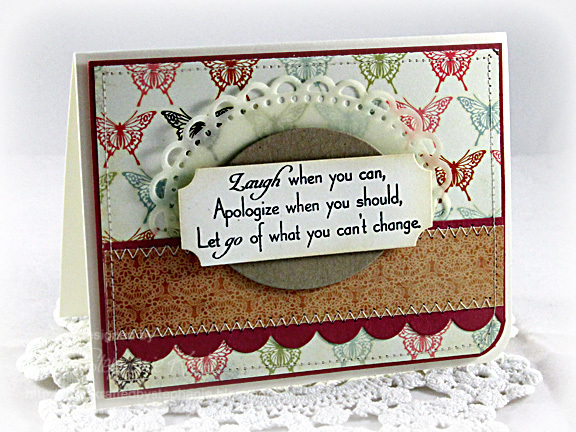 I tucked a cream vellum layer behind each quote to soften each card. 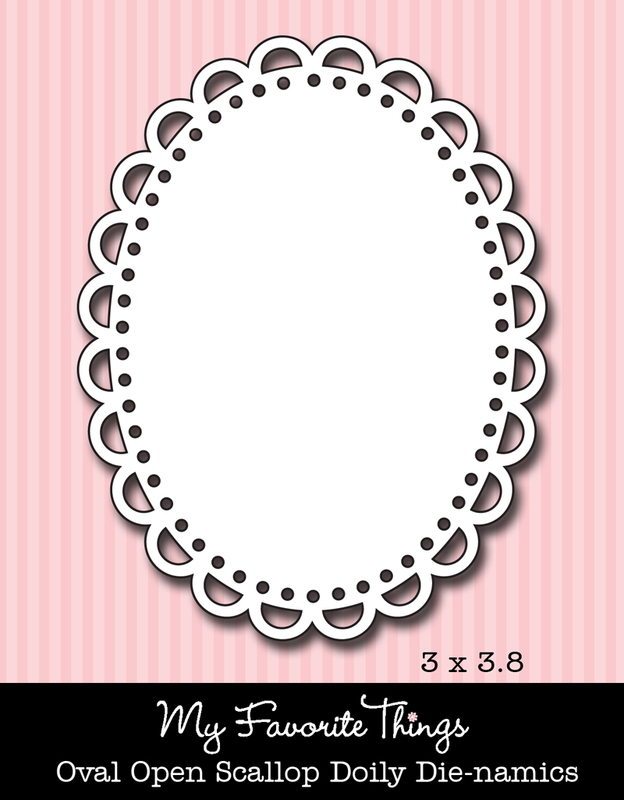 I used the Die-namics Oval Open Scallop Doily Die to cut my vellum. 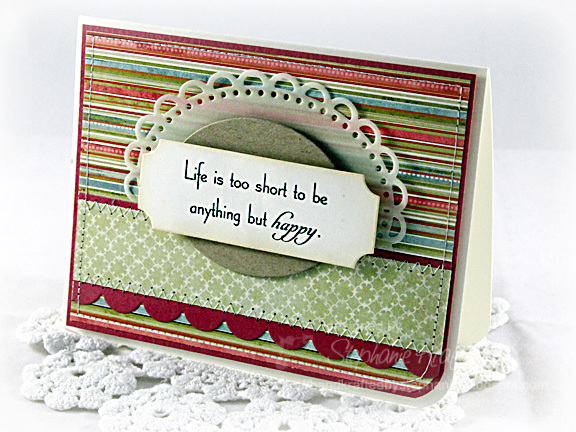 My sentiment and the Kraft oval behind it are from the Die-namics Layered Label Die. 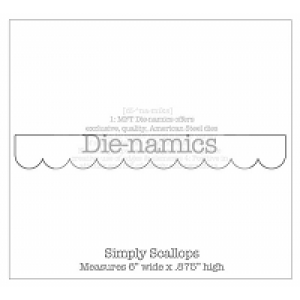 My border uses the Die-namics Simply Scallop. Well, that's it for me! I had a blast creating my projects and being part of the Guest Design Team this month! I'd like to thank Kim for the opportunity and for her generosity and Jody for being such a sweet and organized DT Coordinator! Thank you everyone for visiting and for your encouraging comments! Remember to visit Kim's blog for complete list of participants, then head over to the Boutique to shop! 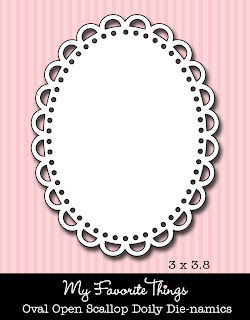 Accessories: Die-namics Oval Open Scallop Doily Die, Die-namics Layered Label Die, Die-namics Simply Scallop (My Favorite Things); Corner Chomper (WRMK), Foam boosters, Thread, Sewing machine. These are all so beautiful! Love them. simply sweet! love every one of them! Such gorgeous cards in this set, Stephanie! WOW! Love them all!!! You really ROCKED the release, hun! I was so inspired by all your creations, as always! You are SUPER talented!!! Pretty. I love the stitching on the cards. 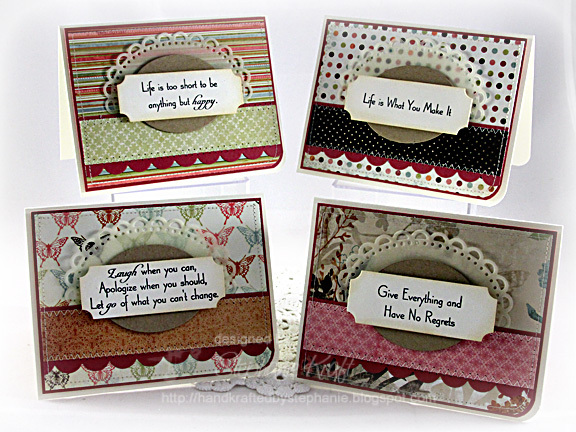 These cards are so pretty (& inspirational-love those Clearly Sentimental about Pearls of Wisdom Stamps! ), but I am still dreaming about your incredible tags!!! 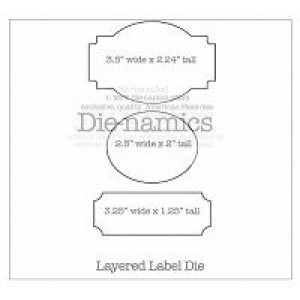 :) Love the way you only rounded one corner-what a nice touch! This is a great new set - very encouraging. Stephanie, these cards are FABULOUS! Love how you layered the sentiment! LOVE! I love the use of these die-cuts to set off the stamps. sooo fabulous....I'm a sucker for a great set of cards! you did awesome this week....thanks for joining us! what a lovely set of cards! These are STUNNING Steph!!! WOW WOW WOW! You rock girlie!! What a very pretty set of cards!! I like those dies!! Love these simple cards with the beautiful words.